Home › › The Rosé Picnic, the new Tradition of the Summer! The Rosé Picnic, the new Tradition of the Summer! All Events › The Rosé Picnic, the new Tradition of the Summer! There was a huge picnic and wine festival that came to Fort York this Summer! 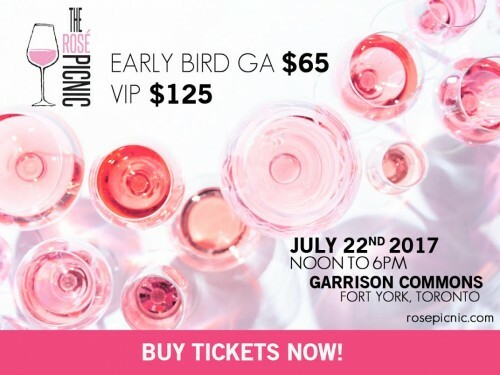 On July 22nd, from noon – 6pm, Fort York was transformed into a sea of Rosé. The Rosé Picnic was filled with delectable food, lively entertainment, and, of course, everyone’s favorite pink drink. Guests were dressed in the Pink or White “summer chic” dress code. The event poured Hogwash Rosé wine from Napa, Rosé Champagne, vodka, and pink cocktails which included a variety of delicious juices and sparkling water. The Rosé Picnic was not only pink drinks, but there was also plenty of exciting musical performances and exclusive VIP experiences. The Rosé Picnic was a day full of summer activities, games and memorable experiences! The famous Chef Mark McEwan, judge from Top Chef Canada was a special guest during this event. Mark crafted some undeniably delicious Picnic Baskets. All of Mark’s restaurants were on site serving food, including- North 44, ByMark, One and Fabbrica. Additionally, free sampling from other vendors of ice cream, popcorn, cotton candy and more were also available. The Rosé Picnic quickly became a favorite summer tradition!